The global e-clinical solutions market is predicted to grow at 11.9% CAGR during the forecast period with the market size reaching USD 10.4 billion by 2024. Different types of solutions such as electronic data capture (EDC) and clinical data management system (CDMS), clinical trial management system (CTMS), clinical analytics platforms, and randomization and trial supply management are majorly contributing to the e-clinical solutions market size. The market has witnessed significant demand for electronic data capture and clinical data management system over the last few years due to mounting demand for improved data standardization. Based on types, the e-clinical solutions market is categorized into electronic data capture (EDC) and clinical data management system (CDMS), clinical trial management system (CTMS), clinical analytics platforms, randomization and trial supply management, clinical data integration platform, electronic clinical outcome assessment (eCOA) solutions, safety solutions, electronic trial master file system, and others, of which electronic data capture and clinical data management system hold the largest share in the e-clinical solutions market, globally. Mounting need for electronic diaries in clinical studies, and the usage of mobile and digital technologies led to the fastest growth of the electronic clinical outcome assessment solutions segment during the historical period, which is also predicted to continue during the forecast period. On the basis of the delivery mode, the e-clinical solutions market is segmented into on-demand/ web-based, on-premise, and cloud-based. Of all, the cloud-based category is predicted to witness the highest CAGR of 15.7% during the forecast period due to reduced maintenance cost, ease of integration, quicker deployment, improved productivity, flexible scalability, and faster operation. Moreover, of all delivery modes, on-demand/ web-based category accounted the largest share in the e-clinical solutions market due to a decrease in price, quicker recovery of data, and easy user access. On the basis of the end user, the market is segmented into pharmaceutical and biopharmaceutical companies, contract research organizations, consulting services companies, medical device manufacturers, hospitals, and academic research institute. Of all, the e-clinical solutions market size for contract research organizations is expected to grow at the fastest rate during the forecast period, globally. In addition, of all end users, pharmaceutical and biopharmaceutical companies accounted for the largest share of the market. The mounting number of clinical trials, increasing clinical trial outsourcing, mounting implementation of software solution during clinical trials, budding demand for improved data standardization, expanding government grants to support clinical research, mounting demand for analyzing and tracking data and expanding research and development expenditure by pharma and biotech companies are the key factors leading to the growth in the e-clinical solutions market, globally. Owing to the growing geriatric population and mounting occurrence of chronic diseases has resulted in increased frequency of pipeline drugs, which further increases the number of clinical trials for the introduction of novel drugs. Some of the other key factors driving the growth of the industry are the amplified IT budgets for drug development and modification from manual data analysis to real-time data analysis. Key factors hindering the growth of the e-clinical solutions market are the high cost of implementation, the low adoption rate of the software, lack of high-speed broadband facility and long approval time. In addition, the dearth of skilled professionals is also having a negative impact on the growth of the market. Geographically, North America is the largest e-clinical solutions market as the region is home to a large number of industry players. In addition, mounting demand for improved data standardization and upsurge in spends on research and development by pharmaceutical and biotechnology companies are also fueling the growth of the North American e-clinical solutions market. 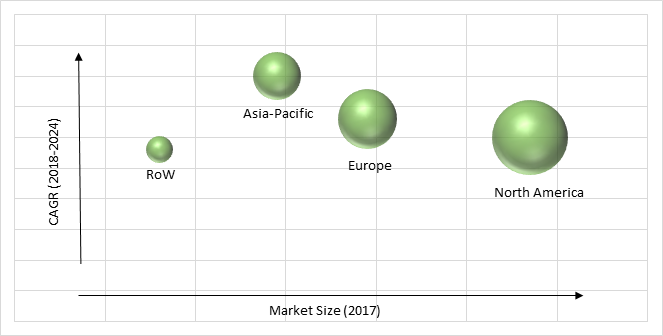 Asia-Pacific is observed to witness significant growth in the e-clinical solutions market during the forecast period, as the region comprises of a large population, easy patient recruitment, and the existence of less strict regulatory strategies. Moreover, mounting government sponsoring to strengthen clinical trials, the less operational cost for clinical trials, intensifying healthcare expenditure, increasing outsourcing of clinical trials, and growing number of pharmaceutical companies and CROs are also facilitating the significant growth of Asia-Pacific e-clinical solutions industry. Market players in the e-clinical solutions industry are investing capital to develop technologically advanced systems. In February 2018, OmniComm Systems, Inc. acquired Algorics, to enhance its product portfolio in a clinical analytics solution. Oracle Corporation, PAREXEL International Corporation Medidata Solutions, Inc., DATATRAK International, Inc., eClinical Solutions, Inc., Bio-Optronics, Inc., ERT, MaxisIT Inc., and OmniComm Systems, Inc. are some of the key players offering solutions for e-clinical solutions. Table 167 Snapshot – Medidata Solutions, Inc.
Table 169 Snapshot – eClinical Solutions Inc.
Table 170 Snapshot – Bio-Optronics Inc.
Table 172 Snapshot – MaxisIT Inc.
Table 173 Snapshot – OmniComm Systems, Inc.